"Chicken & waffle flavored lays? #Murica." On this day (well, technically the day before) in which we celebrate our independence from those limey redcoats and their tea-guzzling ways , it's time we take on one of the truly great debates tearing at the fabric of our country... 'Merica? or 'Murica? When dropping the first letter of America (either sarcastically or to preserve our limited supply of vowels), is it more correct to (a) continue as if it were still there and use the term 'Merica? or (b) produce an altogether different word, 'Murica, to express our facetiousness and/or lack of spelling ability? "P.s. please stop spelling it #murica or #mericuh or any other variation. It's #MERICA. #northerngirlprobs"
"I don't know Harry, I heard the French are assholes" true statement. Elated to be back in 'Murica"
But sadly, there is no consensus around this important issue, which if left unchecked (or at least unmapped) could threaten to undermine the very foundation of the nation. Even more tragic is that someone  was so unthoughtful as to bring up this topic on the day in which all 'Mericans/'Muricans should join together in our hatred of everyone who doesn't acknowledge that we're so totally superior to them. As such, we dutifully bring you an investigation of this debate that you may not have even been aware of. You're welcome. In this endeavor, we collected all geotagged tweets referencing "murica" or "merica" in the United States from July 1, 2012 to June 30, 2013, producing 12,407 references to "murica" and 80,344 references to "merica". If you believe that absolute numbers solve the debate, read no further, as we should obviously err on the side of 'Merica. But if you believe that, you must also believe that "On dit que Dieu est toujours pour les gros bataillons" , which we must point out is in FRENCH, and hence your opinion on this day can easily be ignored. Again, you're welcome. 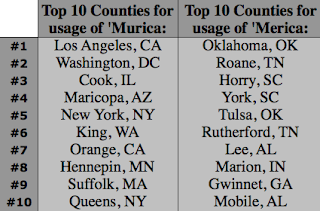 Seeing as there is such a significant preference for 'Merica, we created a normalized measure at the county level to allow for geographic comparison in spite of the massive difference in usage of the terms. 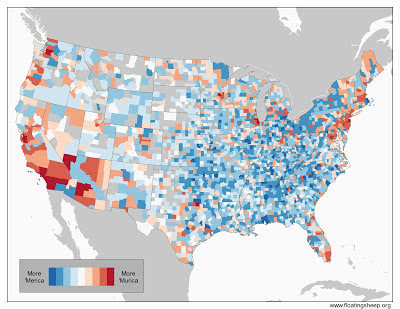 Thus, the maps below illustrate counties' share of tweets for each of the two terms. For example, Cook County, Illinois had the absolute most tweets for either term, with 201 for "murica" and 782 for "merica". But because its 201 tweets represented 1.6% of all tweets referencing 'Murica, and its 782 were only 0.97% of the tweets refrencing 'Merica, it was determined to have a relatively greater usage of 'Murica, and is shaded as such on the map. So in this first map, the areas that are the darkest shade of red are those places where that place produces a significantly greater share of the overall number of tweets for 'Murica than it does for tweets referencing 'Merica. Confused? You're welcome. While it might be remarked that this unusual methodology unfairly tilts the linguistic playing field in favor of the much less used 'Murica, we would respond with: who cares? This is our map and we can do what we want with it. Also, we're academics (aka commies) and are totally OK with doing things like changing the rules to benefit the less well-off. Also, note the holiday appropriate color ramp of blues to white to reds. Clever, yes? You're welcome. As you can see, use of 'Murica tends to be associated with the east and west coasts, with there being fairly little usage of the term, even by relative measures, in the interior of the United States. So it appears that those living in "flyover country" tend to prefer the more simple 'Merica, the coastal elite like to step up their sarcasm an extra notch by exchanging an 'e' for a 'u'. While some of the country's biggest cities -- Los Angeles, New York City, Chicago, Boston, Phoenix, Minneapolis, Seattle and D.C. -- have a relatively greater amount of 'Murica-ness (or should that be 'Murica-lity), the divide between the two spellings doesn't break down along clear urban/rural lines. Oklahoma City and Indianapolis are two of the biggest users of 'Merica, while parts of the Charlotte and Atlanta metropolitan regions are also on the list of counties who believe that it's spelled 'Merica, not 'Murica. Indeed, if you further normalize by creating a location quotient -- in effect controlling for absolute size -- a similar picture emerges, albeit one which tends to emphasize the large urban areas much less, regardless of whether they see themselves (or others) as 'Mericans or 'Muricans. 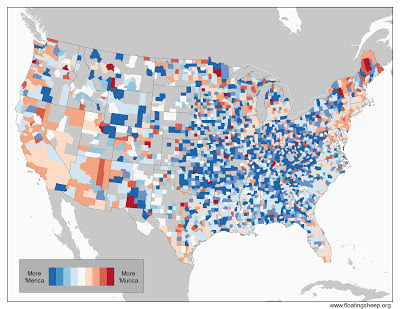 Unlike in the previous map, the most red end of the spectrum here actually shows the places where there is the most parity between the usage of the two spellings, even if there are still a greater number of absolute references to 'Merica than to 'Murica. So less populous counties, or those with many fewer Twitter users, such as Piscataquis County, Maine, with fewer than five or ten overall references to either term, will generally tend to be more red. But perhaps the most interesting (and actually rather methodologically valid) ways of examining the data is to simply look at a ranked list of the top ten counties for each term. One sees here that the top ten counties for 'Merica are almost exclusively in the South, while the top ten counties for 'Murica are outside the South and within large metropolitan areas. So, our working hypothesis (which we suggest you discuss over beer and burgers on this fine day), is that 'Murica is likely a derivative of 'Merica, used ironically by slow-pour-coffee-drinking, skinny-jean-wearing hipsters in big cities. Our extensive examination of hipsters (n=1) confirms this hypothesis and places the epicenter of this plague somewhere in the Greater Boston area. But you can probably spell it however you'd like. No offense intended. Verily, some of the FloatingSheep collective members are British and have yet to make the move to the promised land of 'Merica/'Murica. It's an exciting day when South Carolina makes the top 10 of an internet list that isn't for something completely cringe-worthy. this is cringe worthy. I don't understand why we are making fun of our own country. "I don't understand why we are making fun of our own country." Because laughing is always a good alternative to crying. What I don't understand is why people are suddenly dropping the A in the first place. Was there some late night comedy sketch I don't know about or something? Yep, I agree with the working theory of "slow-pour-coffee-drinking, skinny-jean-wearing hipsters in big cities." It's not how Americans in the Midwest or South or rural areas write, it's how urbanite Americans think that Americans in flyover country write. It's just ignorance with a smug, snooty sense of moral superiority exercised by sophisticated, metrosexual progressive pansies in New York, Chicago, LA and DC. They're mostly harmless, really, and kind of useful for human shields in case of a zombie apocalypse. Totally agree with you. I'm from NY, but hate all the BS elitism nonsense. Maybe they had to sell the "A" to pay for their slow drip or French press coffee.